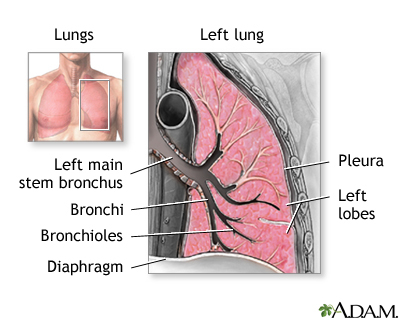 The stage of lung cancer depends on three factors: tumor size and location, presence of lymph nodes in the chest, and involvement of distant organs. These three factors are used in the TNM (Tumor, Node, Metastasis) Classification for Lung Cancer. The tumor is up to 3 cm, surrounded by lung, located on the lobar bronchi. There is no lymph node involvement and no distant metastasis. The tumor is greater than 3 cm, surrounded by lung, or tumor of any size with involvement of the visceral pleura (outermost layer of the lung) or mainstem bronchus. There is no lymph node involvement and no distant metastasis. The tumor is up to 3 cm, surrounded by lung, located on the lobar bronchi, and the lymph nodes around the bronchus (peribronchial) and hilum, on the same side of the tumor, are involved. There is no distant metastasis. Tumor of any size directly invading the ribs, diaphragm, or covering of the heart (parietal pericardium); or tumor in the main stem bronchus less than 2 cm from the carina (junction of left and right bronchi), but without involvement of the carina. There is no lymph node involvement and no distant metastasis. Any tumor size with involvement of the mediastinal or subcarinal nodes, but with no distant metastasis. Direct extension to esophagus, aorta, heart, vena cava, diaphragm, or spin; satellite tumor on the same lobe, or any tumor associated with nodes on the side opposite the tumor. No distant metastasis. Separate nodules in different lobes or any tumor with distant metastasis.